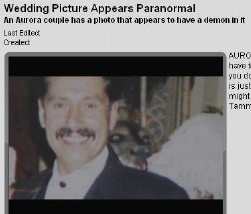 A Colorado man reports he was able to kick his drug habit after a photograph of him at a relative's anniversary celebration showed - literally - a demon on his shoulder. Joe Martinez told Fox 31 News in Denver that drugs were killing his soul. But he's now on the road to recovery because of the photograph. "I look at it and I carry it wherever I go", he told the television station. The photo showed a typically smiling couple at a anniversary reception. What it also shows is what Martinez's wife, Patty, describes as "Satan". "Right away I really thought, I said, 'You're really walking with Satan'", she said. The photo was taken at a family anniversary celebration several years ago. It was in an album until just months ago, but Martinez says he won't be without it now because of the reminder it provides. "There's good and evil in life. The good on the right hand side of me, and the evil on the left side of me", Martinez told the station. The photograph, on close examination, appears to include the image of a dog peering over Martinez's shoulder. 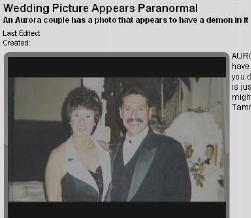 Brian Bonner of the Rocky Mountain Paranormal Research Society said most such cases are explained relatively simply. But for this one, he said, there's not enough evidence to support a conclusion. A photographic expert, John Davenport of Roach Photo, told the station the picture did not have evidence of tampering. "It doesn't look like it was double-printed or spliced in", he said. "The grain is uniform." Martinez admits having battled drugs. "I always prayed to the Lord and told him, 'I can't do it alone,'" he said to the station. He and his wife credit the appearance of the image in the photo for his recovery from addiction. "There's not another high left in me", Martinez said.